Get your XCOM fix in just a few hours. XCOM 2 is great, but a full War of the Chosen campaign is a hefty endeavour. What if you could just chain a few missions together to enjoy the equipment power curve, without having to manage the Avenger? The Tactical Legacy Pack is an experiment in storytelling and campaign structure. 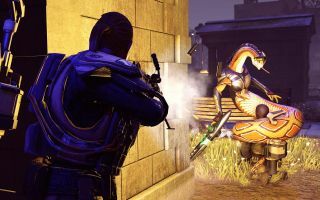 Across seven missions, XCOM stalwart Central Officer Bradford recounts the time between the end of Enemy Unknown and the start of XCOM 2, covering the collapse of the XCOM project, and the formation of the resistance. His narration even comments on some of your actions as you complete objectives. Rescue some civilians and Central recalls how his rogue squad would rescue whoever they could on their mission to find a safe haven. Between missions you get a choice of two squad-wide upgrades—special ammo or special grenades?—and your squad automatically levels up and gains new traits. Their guns get better too, which is useful because the enemies become more advanced with each mission. You essentially get to see the game's entire power curve unfold over the course of just a few hours. I like it a lot. The missions are challenging and there's a big score ticker in the top right corner measuring your performance. If you lose a soldier you lose a few thousand points, but you can kill enemies and complete objectives to get the ticker back into the green. You carry your score with you between missions and the final tally will determine whether you receive a bronze, silver, or gold medal. The Tactical Legacy Pack adds a bit of value to War of the Chosen campaigns as well. Once you've beaten it, the Enemy Unknown weapons and armour will appear in the standard campaign, and the map assets will turn up in the campaign's procedurally generated maps. The only downside is that playing these campaigns first will spoil the advanced enemies you end up fighting in War of the Chosen. The only thing I'd wish for is more control over my squad's advancement between missions. In the campaign it takes a few dozen hours to bring a sharpshooter up to a high level, and it would be fun to experiment with builds over the course of a shorter sprint—something I could complete in a few hours on a Sunday afternoon. Admittedly this could ruin the novelty of new skills for new players, but for players who have run a few campaigns it would be a fun way to experiment with War of the Chosen's systems. It's a neat update though, especially for free. If you already own War of the Chosen then you can download it for nothing before December 3. On Steam XCOM 2 is free to try and cheap to buy for the next couple of days as well. It is an extremely good strategy game.